Sam is in his beachside hometown when a visiting pop star, Holly, decides to take a swim — during box jellyfish season — and appears to be in distress. Sam, already running late for a dive exam with Josie, leaps into the ocean to save Holly and before they know it a strong current has dragged them out into open water. Josie, not knowing Sam's whereabouts, is frustrated that Sam is running late. She feels he always lets her down. Meanwhile, Sam must fight to keep himself and his new, but difficult, friend from drowning, as well as from the many deadly creatures that live in the water. When Holly is stung by a box jellyfish, Sam gets her onto a reef pontoon and applies first aid. But when he drops the flare — their only chance of rescue — into the water, he must dive in and get it despite the possible presence of a tiger shark that has been circling. Sam retrieves the flare and sets it off. They're saved. Next day, Sam sees a sincerely grateful Holly off and takes the dive exam with Josie. Josie realizes Sam hasn't let her down after all — he had a pretty good excuse! Note: the order of episodes in this guide follows the official order as found in promotional material which does not match the broadcast order. Sam and Rikki are on a trip to the Rocky Mountains with Harry and Jordan's scout troupe and his mum, Laura, when their bus crashes down a canyon. Everyone escapes but some members of the group are injured. Sam and Rikki set off back along the forest road to where they can get mobile phone reception and call for help. There's a touch of compe- tition between the boys as, back home, they both want to go to the school dance with the same girl — Josie. But now's no time to argue because they discover they are being followed by a massive, unpredictable grizzly bear. After several near misses the boys manage to trap the bear in a forest hut as well as resolve their differences on the home front. When everyone is safe, Sam and Rikki call Josie and soon the boys are competing yet again. Sam and Rikki fly into a remote airstrip in Tanzania, on their way to give a presentation on the Tasmanian Devil at a Wildlife Youth League conference. They land and meet up with their friend Emma, another participant. She tells them there's been a transport mix up and the trio are going to have to wait several hours for their ride. But when Emma is severely stung by fire ants, Sam has to cross the Serengeti plains to get help, and is stalked by a lioness and attacked by a spitting cobra, who shoots venom into his eye! Meanwhile Rikki, who stays at the airstrip to look after Emma, suffers his own agony when he falls out of a tree he climbed in an attempt to get phone reception. Sam comes across an animal smuggler's truck, parked in the wilderness. With Emma and himself needing urgent medical help, his only option is to drive the truck overland to get them to hospital. Sam also releases the trapped animals he discovers in the back of the smuggler's truck. Later, they all attend the Wildlife Youth League conference and Sam gives his address. Not only is he there to talk about the plight of the Tasmanian Devil, but also animal smuggling. Sam, Rikki and Nathan go caving in the Australian outback and come across a bed of scorpions in an underground cave. But Nathan's leg gets trapped when a cave-in occurs, which also crushes their satellite phone. Nathan's in a bad way and Sam is his only hope. Sam and Rikki must get past the scorpions blocking their way to go get Nathan help. Once outside, the boys discover the truck's battery is flat and their supplies have been eaten by animals. 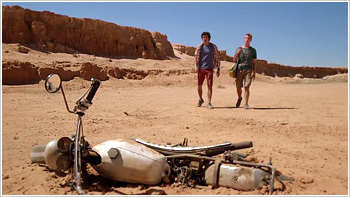 Sam and Rikki realise they are lost when Sam discovers his watch/sun compass technique isn't working — due to Rikki never setting the time on his watch. As they continue to trek across the desert they are pursued by dingoes, but Sam manages to temporarily scare them off. The next day, their water supply gone, Rikki notices that Sam's wristcam is picking up a signal, and they leave a frantic message for Harry and Jordan. They're not sure if they're getting through, however. Sam despairs not only for them but for his brother. Sam feels he's let Nathan down. Just as they are about to lose all hope, a rescue plane flies overhead (Harry and Jordan raised the alarm after all! ), and they're saved. Sam heroically leads the rescuers to Nathan, and learns that his brother's going to be fine. Sam takes Harry out zip-lining on Nathan's new Flying Fox to practice their skills ahead of their upcoming trip to New Zealand. A zip-line malfunction forces Sam and Harry to clamber off the equipment onto a nearby tree, where Harry is bitten by a funnel web spider. Completely alone, they head for the road. Along the way they come across a feral pig, and are chased through the bush. With Harry getting worse, they change course and head into an abandoned railway tunnel. Inside, the ground is teeming with sewer rats, but what's even worse — the pig re-appears and chases them through the tunnel. Sam and Harry exit the tunnel to find a rotting rail bridge — their only option is to cross it. Harry is now experiencing double vision but they can hear the pig in the tunnel behind them. As Harry goes to take the final big step the funnel web appears from his clothing and crawls down his arm. Sam heroically lets the spider crawl onto his own arm before swiping it off. But Harry passes out. Sam carries his little brother to the road as Nathan's car pulls up to take Harry to help. Sam and Rikki are in the Amazon on a rare-orchid hunt with Brazilian orchid expert, Claudio. But Sam and Rikki's boat capsizes, separating them from Claudio, and spilling them into piranha infested waters. They make it to the bank, but soon Rikki falls down a hole into a watery cave. Sam abseils down to help him, and they realise they are not alone — there's a giant anaconda in there too! They move to a mossy ledge, but discover that the water level is rising because of the heavy rain upstream. With time running out, Sam and Rikki get across the cave pool, pursued by the angry anaconda, and worm their way up a fissure in the rock. Sam and Rikki escape the cave, and Sam catches sight of the rare orchid. 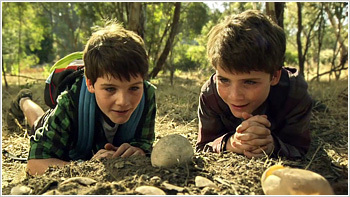 Sam convinces Rikki to help him go and get the orchid, but as they head towards it, quickly find themselves trapped in quicksand. Sam keeps his head and is able to free them both from the clutches of the deadly goo. Claudio finds them on the riverbank with the rare orchid — and invites a stressed-out Rikki along on his next dangerous expedition! Sam and April visit a dormant volcano in Borneo with Mayang, an old childhood friend of Sam's. Sam and Mayang race to the top, but on the way, Mayang falls and injures himself. The volcano suddenly erupts and lava begins spewing everywhere. Sam and April try to take Mayang back to the jeep, only to find that lava has cut off the access road. The lava follows them to the beach, and Sam and April find an old rowboat, and with makeshift palm frond oars, they paddle away with Mayang on board. The rowboat gets stuck on a reef and when Sam gets out to push, he is stabbed by a stingray barb. Sam puts his arm in the nearly boiling hot water (from the lava), and the toxin turns to jelly — a first aid tip Sam has banked somewhere in his brain. Later, a lump of volcano rock smashes a hole in the boat, but April uses Laura's camera and bag to plug it, and they make it to the island. Sam sees an old research hut at the top, but his way is blocked by a big mother crocodile. April mimics the sound of baby crocodiles to lure it away as Sam gets past and finds radio equipment in the hut, and calls for help. Thankfully, April had kept the memory card from the camera and later, when they are safely back at camp, Laura is very impressed with the photos. Camping in the Northern Australian tropics, Sam, Rikki and Josie come across some cute cassowary chicks — and their angry, full-grown mother! On the run from the cassowary, the trio notice that some old oil drums have rolled into the river. With the oil spreading, Sam decides to run to the nearest farmhouse to notify the authorities, while Rikki and Josie build a makeshift dam out of their kayaks. Along the track, Sam comes face-to-face with the angry cassowary again, and can't seem to get away. When a tropical storm breaks out, Sam finds shelter in a cave, where he's cornered by a deadly coastal taipan. Sam courageously manages to stay still until it moves off his boot. But, during the storm, the oil drums break through Josie and Rikki's dam and start floating down the river. Meanwhile, Sam makes it to the farmhouse, but is stuck between the cassowary and an aggressive guard dog. Sam discovers the cassowary was only following him to get his trail mix. Sam throws the trail mix near the guard dog. When the cassowary runs for the food, the guard dog is scared away, leaving Sam able to reach the farmhouse and make the call to the authorities. When he spots the floating drums he uses the farm's quad bike to push some large round hay bales down to the river to make an instant dam, saving the day. The Fox family and Rikki are camping in the Egyptian desert with Emma. During a camel ride, a sandstorm separates Emma from the group, and Sam goes after her. Sam finds Emma but now they have both lost their camels. As they're both choking in a wall of dust they take shelter in an ancient well, but become trapped when the rope ladder breaks. Unable to climb out of the well, Sam and Emma have to deal with rats and a camel spider, before fashioning a grappling hook out of the rope and the metal rungs of the ladder to help them climb up. When they finally emerge from the well, the sandstorm has passed, but a hungry jackal appears, and is showing a lot of interest in Sam and Emma. Sam uses some beef jerky and Emma's ancient artifact (not ancient at all) to lure the jackal away from the well. They find Emma's disobedient camel. Sam plays earlier recorded footage of their guide's voice to get the camel to let them climb aboard. On returning to the family tent, Sam finds an Egyptian Cobra about to attack Rikki, so boxes it up using a crate and hurls it from the tent, saving his friend. We did a camel ride... amazing! While trekking on Indonesia's Komodo Island, Rikki goes off-track to take a pee — and falls down an embankment. Sam goes looking for him and falls down the slope too. When a komodo dragon appears at the top, Sam and Rikki are forced to go through unknown country to avoid it. They climb up a tree, but the dragon climbs after them and bites Rikki on the ankle. Sam explains to Rikki that after komodos bite their prey, they leave them to weaken slowly before killing them, so they need to move! When Sam leaves Rikki at the bottom of a cliff to scout ahead, a komodo dragon comes up and licks Rikki's cheek. Sam rescues him and they run towards a ranger's hut, with the hungry komodos following. In the hut, but surrounded by komodos, Sam finds some bottles of soft drink, and combines this with his mints to create a mock explosion, frightening the komodos off. Making their escape, Sam and Rikki run face-to-face with an angry water buffalo. When the komodos keep coming, Sam slips and falls into mud containing buffalo dung, and realises that the dragons don't like the smell, so he pushes Rikki in it too. Covered in dung mud, Sam and Rikki bravely walk past the dragons without being attacked, and arrive back at the base hut. In the bayou of Louisiana, Sam and Rikki go fishing with a family friend, Rene. As Rene guides them through the swamp, he warns them about the Loup Garou (werewolves with glowing red eyes). They spot an endangered alligator snapping turtle in the water, and Rene asks the boys to keep an eye on it while he goes to get some tagging equipment. 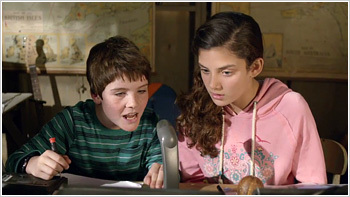 But Sam and Rikki get lost in the bayou while trying to track the moving turtle. Sam and Rikki attempt to get to a fishing cabin by raft, but it starts to sink — and their only way out is to swim under the water and through the alligators! Sam had heard that, if they do that rather than swim across the surface, the alligators will mistake them for alligators. They make it to the cabin where they find a radio. Sam tries to signal for help by blasting Cajun music across the water, but the only thing that seems to have heard them is the Loup Garou! The boys are freaked until Sam realises that it's Rene, not a werewolf — they are rescued at last. 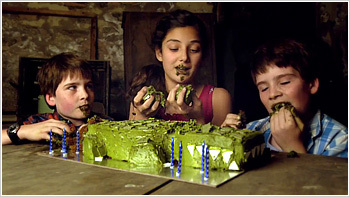 The next day, Sam and Rikki find that the whole Fox family has gathered at the jetty to celebrate Sam's birthday. Surprise! Sam and Nathan are on a guided tour with Nathan's friend Raj to see the elusive and endangered Bengal tiger in a remote reserve. They cross a rope suspension bridge and find some tiger footprints on the track. 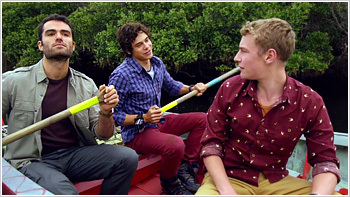 While Raj heads off to investigate, an earthquake hits, separating him from Sam and Nathan. Sam recovers to find Nathan with his leg pinned under a fallen tree. Sam releases Nathan despite the nearby angry swarm of bees, which Sam is dangerously allergic to. 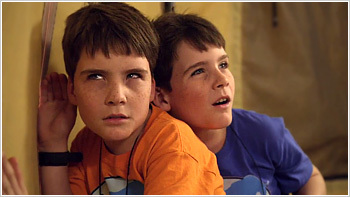 As Sam and Nathan search for Raj, they become aware that a tiger is stalking them. They find that the suspension bridge has collapsed during the earthquake, leaving only a single rope line across the ravine, and Raj is trapped on a ledge below. They help Raj back up, but with regular aftershocks and the tiger lurking, the trio has no choice but to slither across the rope line, one by one. Sam is the last to go but is distracted by a cry from the grass. He finds a stray tiger cub, and is suddenly confronted by its mother with a ferocious roar. Sam roars back at the tigress, distracting it enough to escape across the rope and return to camp. Ju Sam and Josie go to Kenya to search for the mythical Jumbo Jumbo flower with Uncle Shau, which they hope to find and study as a part of a school project. Josie is very keen to excel but Sam isn't all that focused on botanical stuff. They paddle through hippo-infested waters, but as they hike towards the hidden ravine which Shaun is certain contains the Jumbo Jumbo, Sam and Josie tumble into an abandoned mine shaft. Josie twists her ankle in the fall, and when they get back out, Uncle Shaun is nowhere to be seen. As they debate over what to do next, Sam disturbs a huge nest of wasps, forcing them to run. They reach a clearing, only to enrage a territorial mother elephant and her baby, so have to sprint for their lives again. Sam crashes into stinging nettles and red welts appear on his arms. Josie helps him with her superior biological knowledge and applies a salve. Her scholarly nature has come to Sam's rescue! A thunderstorm strikes, forcing them to pitch a tent. But the mother elephant returns and stomps their tent, almost crushing Sam. They escape and head for the hidden ravine, to find Uncle Shaun and the Jumbo Jumbo — which stinks! Potentially stuck in the wild for days with Josie's injury, three helicopters suddenly fly overhead, organised by Rikki, to take them out of the ravine.